The Concise Encyclopedia of Computer Science is the perfect desk reference to guide you beyond the hype and jargon that entangle computer technology and its ubiquitous applications. 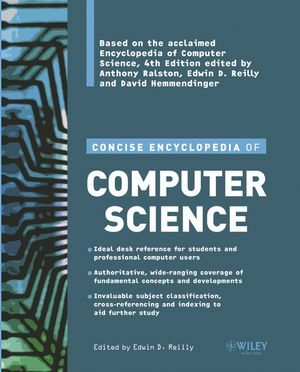 Carefully edited to be readily accessible to the non-specialist, this Concise Edition comprises shortened versions of over 60% of the entries that appear in the full Fourth Edition of the Encyclopedia of Computer Science (Ralston, Reilly and Hemmendinger). This structure enables you to follow a coherent pattern of study or research in any given subfield. Extensive cross-referencing at the start of every article provides a clear roadmap to lead you to key related topics. You'll also find appendices covering Abbreviations, Acronyms, Notation and Units, a Timeline of Significant Milestones in Computing, plus a full Index. In short, all the back-up you'll need whether you are studying, teaching or working in the field of computing. Edwin D. Reilly is Professor Emeritus of Computer Science at the State University of New York at Albany. He served as the first chairman of its computer science department when founded in 1967 and as the first director of its computing center in 1965. Prior to that time, he served in computer management positions at the General Electric Knolls Atomic Power Laboratory in Schenectady, NY. He began his career in computing at the National Security Agency in Washington in 1955. He holds the Ph.D. in physics from Rensselaer Polytechnic Institute and is currently president of his consulting firm Cybernetic Information Systems. He is the co-author of the textbooks Pascalgorithms and VAX Assembly Language. He is a member of the Association for Computing Machinery, the IEEE Computer Society, the American Physical Society, the Mathematical Association of America, Sigma Xi, and the America Association for the Advancement of Science. David Hemmendinger is Associate Professor of Computer Science and department chair at Union College, Schenectady, New York. He has also taught computer science at Wright State University, Ohio. His interests include programming languages, concurrent programming, and formal verification of hardware designs. He began work in computer science in 1981, having previously taught philosophy at the City University of New York, and at Antioch and Kenyon Colleges. He has degrees from Harvard and Stanford Universities, Yale and Wright State University. He is a senior member of the IEEE, and a member of the Association for Computing Machinery, Phi Beta Kappa, and Sigma Xi. Appendix I. Abbreviations and Acronyms. Appendix II. Notation and Units. Appendix III. Timeline of Significant Computing Milestones.